Günther Charwat, Johannes Peter Wallner and Stefan Woltran. Wolfgang Dvořák, Matti Järvisalo, Johannes Peter Wallner and Stefan Woltran. 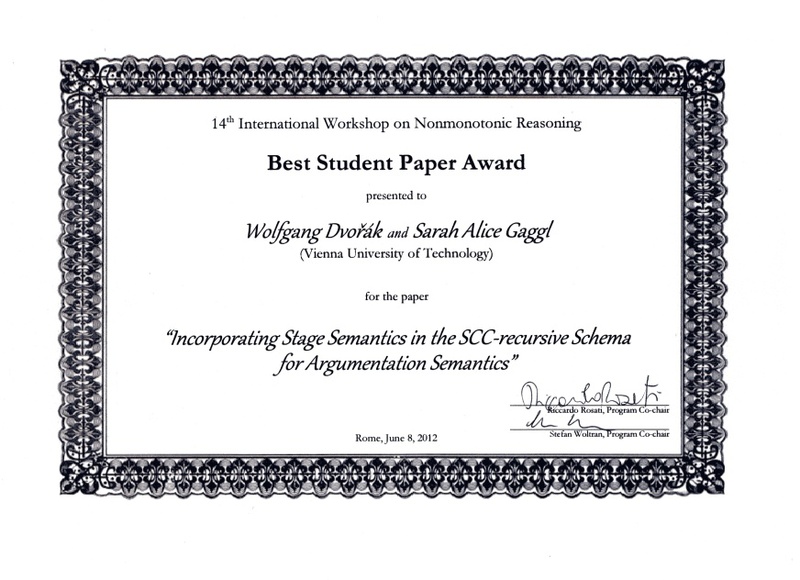 Incorporating Stage Semantics in the SCC-recursive Schema for Argumentation Semantics. Wolfgang Dvořák and Sarah Alice Gaggl. 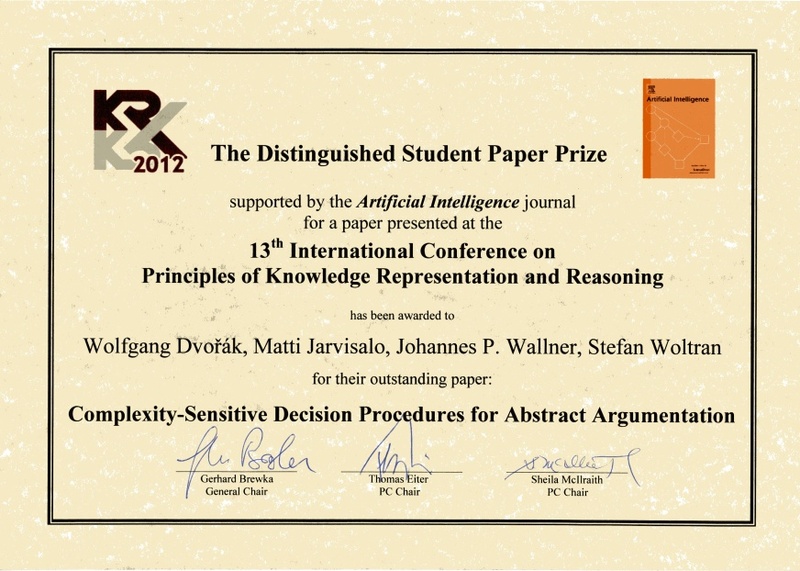 A short report has been posted on our faculty web-page (in german): http://www.informatik.tuwien.ac.at/aktuelles/633. Wolfgang Dvořák, Stefan Szeider and Stefan Woltran. A system description of the CEGARTIX-system has been accepted for presentation at the PoS 2012 workshop. The cf2 argumentation semantics revisited. Sarah Alice Gaggl and Stefan Woltran. Journal of Logic and Computation 2012; doi: 10.1093/logcom/exs011. [ bib | paper]. Towards Fixed-Parameter Tractable Algorithms for Abstract Argumentation. Wolfgang Dvořák, Reinhard Pichler and Stefan Woltran. Augmenting Tractable Fragments of Abstract Argumentation. Wolfgang Dvořák, Sebastion Ordyniak and Stefan Szeider. 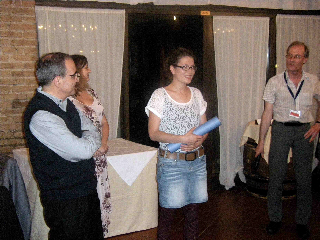 Nadia Creignou, Johannes Schmidt, Michael Thomas and Stefan Woltran. Complexity of logic-based argumentation in Post's framework. The Pictures of the INAP-Conference (and of our presentations there [34,35]) are online and can be found here and here. We are happy to report that we have two papers accepted at the 19th International Conference on Applications of Declarative Programming and Knowledge Management. dynPARTIX, an abstract argumentation system based on tree decompositions and dynamic programming is now available on its webpage. Manifold Answer-Set Programs for Meta-Reasoning. Wolfgang Faber and Stefan Woltran. 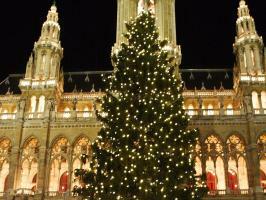 On 7th and 8th of December 2010, Gerd Brewka, Stefan Szeider and Stefan Woltran organized a Mini-Workshop ("Argumentation Christmas Meeting") at the Vienna University of Technology, considered as a forum for researchers in the field of argumentation to interchange ideas and present novel or ongoing work. Participants were: Ringo Baumann, Gerd Brewka, Martin Caminada, Wolfgang Dvorak, Sarah Gaggl, Sanjay Modgil, Emilia Oikarinen, Stefan Szeider, Serena Villata and Stefan Woltran. at COMMA 2010 (sponsored by Taylor & Francis). See also http://www.informatik.tuwien.ac.at/aktuelles/364. The web-paltform of ASPARTIX is now available online. Visit http://rull.dbai.tuwien.ac.at:8080/ASPARTIX to see the web application. We give a system demonstration of the web-platform of ASPARTIX at the COMMA 2010 in Desenzano del Garda, Italy, 8th-10th September 2010. Sarah Gaggl and Stefan Woltran. 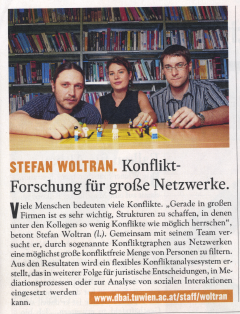 Uwe Egly, Sarah Gaggl and Stefan Woltran. Gerd Brewka and Stefan Woltran. (5) Abstract Dialectical Frameworks. On 3rd and 4th of December 2009, Gerd Brewka and Stefan Woltran organized a Mini-Workshop ("Argumentation Christmas Meeting") at the University of Leipzig, considered as a forum for researchers in the field of argumentation to interchange ideas and present novel or ongoing work. Participants were: Leila Amgoud, Tony Hunter, Tom Gordon, and Henry Prakken. Nomination for the "Wiener Zukunftspreis 2009"
Our project has been nominated for the "Wiener Zukunftspreis 2009" under the category "Startups and Newcomer". Every year the city of Vienna together with the newspaper "News" awards the "Wiener Zukunftspreis" to scientists and creative projects of Vienna. 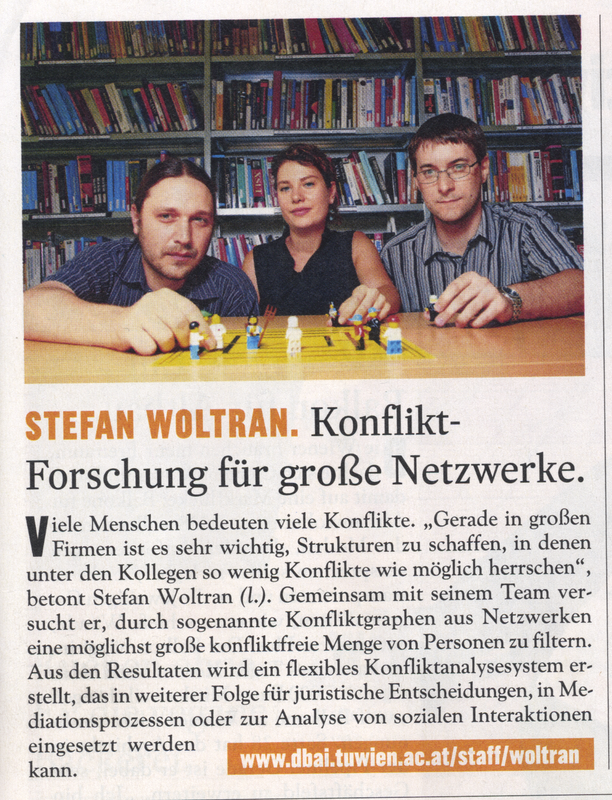 Interview of Stefan Woltran in "derStandard.at"
Notification of ICT Call 2008 on "www.informatik.tuwien.ac.at"
Notification of ICT Call 2008 on "wien.at"